As more and more musical information is revealed from my CD collection by these higher-resolution digital converters, I've wondered just when improvements in playback technology will become superfluous. 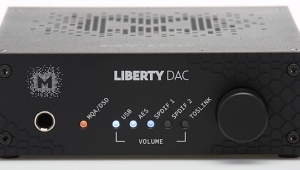 Given the CD format's intrinsic limitations16-bit word length and 44.1kHz sampling rateand less than ideal A/D converters used in recording or mastering, there must be a point beyond which more and more sophisticated D/A converters are meaningless. 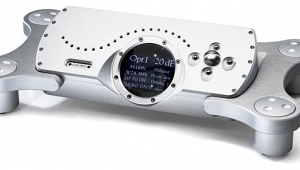 The audiophile's increasingly powerful microscope can't resolve what isn't encoded on the CD. Just how much more music is on our CDs waiting to be revealed by better D/A converters? This question is of paramount importance. If the answer is "very little," all our treasured music on CD will never sound much better than it does today, regardless of heroic efforts by high-end designers. This is indeed a grim scenario. On the other hand, what if our CDs contain wealths of musical information just waiting to be uncovered? This is the music lover's dream; our favorite music would have the potential of offering a far greater musical experience than we have previously imagined. Further, our large financial investments in CDs would be much more worthwhile if they contained the hidden treasure of greater musicality. 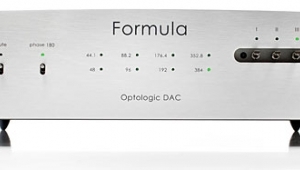 Although I strongly believe that large improvements in CD sound can be gained by better A/D converters at the recording end of the chain, I've been pessimistic about the potential of better digital playback technology alone to make CD more musical. This question has a significance far beyond this generation's musical enjoyment; many analog master tapes of priceless recordings are lost, intentionally destroyed, or become unusable with age. Assuming that humanity 100 years from now listens to the same music we listen to today, the amount of information encoded on digital master tapes and CDs establishes the limits of musicality for all future music lovers. But how is it possible to resolve this question of CD's potential for better sound? 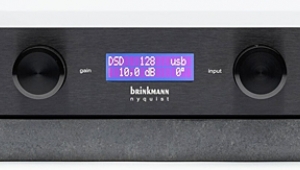 There is only one way: listening to higher- and higher-quality D/A converters. With each incremental improvement, we are allowed a little wider peek into the CD format's possibilities. This is one reason why I'm so fascinated by high-end digital playback. Now, about what this discussion has been leading up tothe new $14,000 Mark Levinson No.30 Reference Digital Processor. While other processors have provided narrow glimpses into digital's musical potential, the No.30 throws wide open the door on what digital audio can achieve. And the view is stunning. A report on the No.30 is by necessity long and technical; the unit's innovative and elaborate design warrants nothing less than a full discussion. For those not inclined to bear with me through the techno-nerd stuff, I've separated it from this description of the No.30's inputs, outputs, and functions. From the first look at the No.30 it's apparent that the processor represents a monumental design effort. 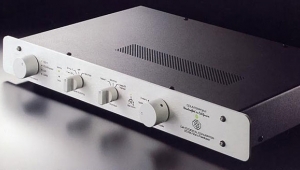 Consisting of two parts, the PLS-330 power supply and the No.30 processor itself, the system looks and functions like no other D/A converter. The processor's appearance, industrial design, and user interface are works of art in their own rights. 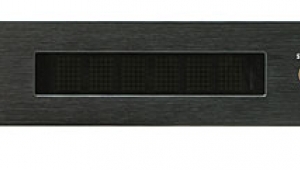 The thick black front panel is flanked by two 7.5"-tall "towers" that run most of the unit's depth. Further adding to this striking visual design, the front panel is curved outward, giving the almost subliminal impression of an invitation to use the controls. The front-panel portion recessed by the curvature holds the engraved and white lacquer-filled Mark Levinson logo and model number, along with a round button that puts the unit in "standby" mode. 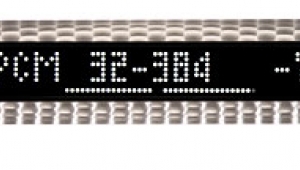 A large alphanumeric LED display commands most of the front panel. The display provides an unprecedented level of feedback to the user. In addition to indicating which of eight digital inputs is selected, the display also names the digital source. 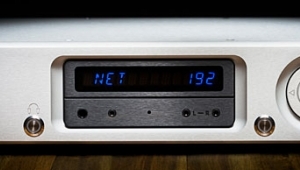 For example, if we had a two CD transports, a DAT machine, Digital Audio Broadcast (DAB) receiver, LaserVision player, and an additional auxiliary digital source, the designations "CD1," "CD2," "DAT1," "DAB1," "LV1," or "AUX1" would be displayed when the appropriate input is selected. Each of these "aliases" can be assigned to any input by the user through DIP switches inside the chassis. The display has other clever touches. When switching between digital sources (from DAT1 to CD2, for example), the display reads "DAT1 MUTING," then "CD2 LOCKING," and finally "CD2 44.1KHZ." 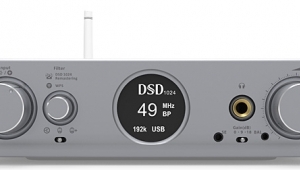 If no digital audio source is connected to the input selected, the legend "NO DAS" is displayed after the source name. This cycle, which takes about four seconds, is accompanied by a fade-down of volume of the previously selected source, total output muting, and a fade-up of the new source. Nice. The No.30 can accommodate up to eight digital sources, corresponding to the row of buttons marked 1 through 8 below the display. Three other identical pushbuttons grace the front panel: polarity inversion, display intensity (three levels plus Off), and a digital record select button. This last function allows recording of one digital source while listening to another. Pressing the record select button changes the display to show which source is connected to the No.30's digital output"RECORD CD1," for example. After pressing the record select button, an input-select button can be pressed, sending it to the record out jack. The display returns to normal after a few seconds. 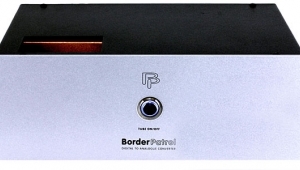 Three small red LEDs indicate when absolute polarity is inverted, if the selected digital source has a copy-prohibit flag, and if the digital source conforms to the professional AES/EBU digital audio interface specification. AES/EBU? 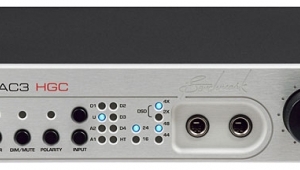 Don't consumer digital processors and transports use the S/PDIF digital interface? 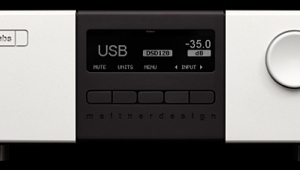 Yes, but Madrigal is trying to change that for high-end products: the No.30's five electrical digital inputs are all XLR jacks, and designed to accept the full AES/EBU-specified signal (footnote 1). The two formats, however, are more similar than different. Both use identical coding, clock recovery, and data frame structure. 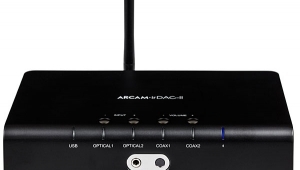 The consumer version is unbalanced, typically carried on an RCA-terminated cable; the AES/EBU spec calls for a balanced signal with XLR terminations. The other significant difference is voltage: S/PDIF is typically a 0.5V signal, the AES/EBU signal about 5V (footnote 2). 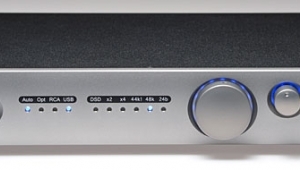 Madrigal believes the AES/EBU interface offers higher sonic quality than the S/PDIF. I confirmed this in my Vol.14 No.5 review of Madrigal's AES/EBU-equipped Proceed PDT transport and PDP digital processor. 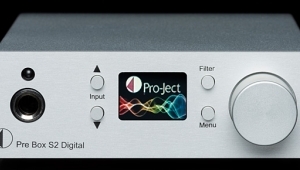 No transports other than the PDT (and a few professional models) include AES/EBU output. By mid-1992, however, Madrigal will introduce the AES/EBUequipped No.31 transport as a companion to the No.30. 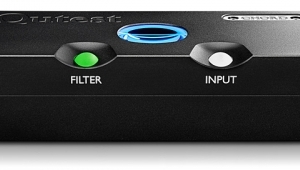 Besides the five XLR electrical digital inputs, the rear panel contains two Toslink optical inputs and one AT&T ST-type optical jack. The Toslink inputs (also known as EIAJ optical) were included for compatibility with other products. The Japanese mass-market manufacturers are rapidly eliminating RCA digital output jacks in favor of Toslinks. The motivation is pure economics: virtually everyone in High End agrees that the bandwidth-limited Toslink is markedly inferior to electrical and ST-type optical. Serious listeners are therefore advised to use the ST optical input.